Hello Spring! I am so ready for warm weather and being outside in the sunshine. I'm sure many can relate. 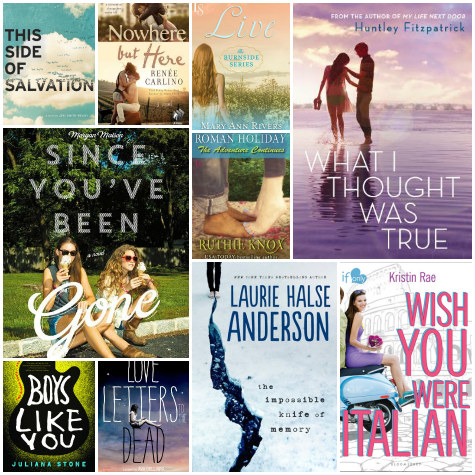 Below are my top ten books, currently, on my spring TBR list. I say currently, because I'm a mood reader and this list could always change. Have you read any of these? Or planning to? Let me know in the comments below. Be sure to check out The Broke and the Bookish for more details on this awesome weekly feature. Of course I come here & spot books I temporarily forgot about while making my list. So many good contemps out now/soon! We have a lot of cross over! Most of your books are also on my tbr and three of them made my TTT post. I especially can't wait for Huntley Fitzpatrick, Morgan Matson and Kristin Rae! I really want to hear more about Love Letters to the Dead! That Anderson book has been on my TBR for awhile, but I just haven't been in the right mood. Great choices on your list! I really liked This Side of Salvation, I had never read anything like it before. And you know I'm excited for Nowhere But Here (minus the ridiculous outfits on the cover), especially once we figured out what the story is actually about! I liked Love Letters to the Dead but it was a little too much like Perks of Being a Wallflower for me to really be able to get behind. Really want to read these too! Love Letters to the Dead is on my list as well. I should have put The Impossible Knife of Memory on my list as well since I got a hard copy of it a few weeks ago. Oh and I DEFINITELY plan on pre-ordering a copy of What I Thought Was True. Huntley Fitzpatrick is amazing. Love the cover of Since You've Been Gone, it's really summery! First of all, LOVE the collage of book covers. I must learn your secret! Second, GREAT books! So many I am looking forward to as well. I just need more reading time to get through them all and then some. Also, Love Letters to the Dead - I really liked it. It's such a uniquely and beautifully written book :) Happy reading, G! Those are some awesome books! What I Thought was True is such a wonderful contemporary and The Impossible Knife of Memory is incredible. I am adding some of these other books to my list!